Converse and 100 Club recently announced Azari & III will headline an exclusive date at the 100 this June to celebrate its one year anniversary. Presented by Loose Lips, the night will also feature support from Chad Valley, Siren and DJ sets from Friendly Fires and Night Works. 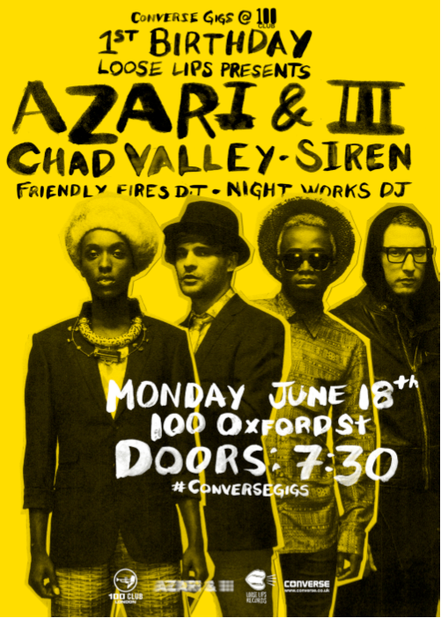 Describing themselves as “A cerebral yet kinetic series of forgotten emotions, wandering hopes and crystalline fantasies, sinking into the impending darkness of the city in decent”; Toronto quartet, digital funk/pop provocateurs Azari & III will take the infamous stage, bringing with them their undeniably memorable sound. Chad Valley, the alias of Hugo Manuel is the vocalist of the band Jonquil and one of the founders of Blessing Force, Oxford's very own in-sourced art collective. Gaining support from Huw Stephens and The Guardian, his latest offering, ‘Equatorial Ultravox’, should expand his evergrowing fan base prior to his first full length studio album set for release later this year. Siren is a half German, half Australian one-time skateboarding pro, turned full time musician. An array of addictive melodies and pop is what you can expect from Stefan Evan Neidermeyer’s debut single. ‘Bucket Of Blood’ is a catchy song and has already acquired support from the likes of Zane Lowe and Nick Grimshaw.